Mailbox Monday was created by The Printed Page. It is the gathering place for readers to share the books that came into their home last week. Currently on tour, it is hosted by a different blog each month. The October host is Book Dragon’s Lair. Told in the same “serial novel” format that made 2011’s No Rest for the Dead such a commercial and critical success, Inherit the Dead is a collaboration among twenty of today’s bestselling mystery and thriller authors—each taking a chapter of the narrative and infusing it with their signature style. I’m planning to finish The Signature of All Things tonight. I love The Rosie Project! Hope you enjoy it! Just wondering if the characters have Aussie accents on the audio? Yes they do! I just started listening to it today. 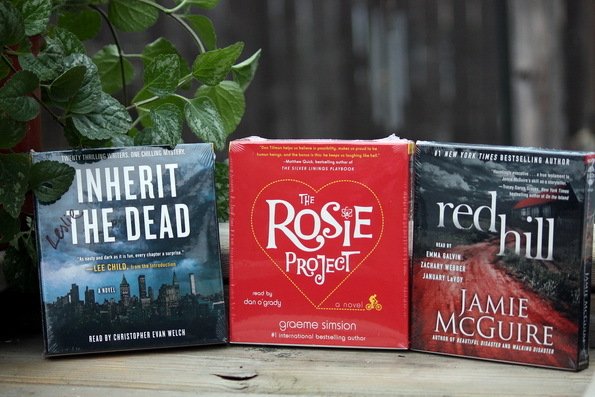 Looking forward to The Rosie Project – enjoy all your new audios. The Rosie Project caught my eye. I will look forward to your review. Have a great week. I’ve heard The Rosie Project is wonderful in print – I hope it is on audio as well. I’ve been curious about The Rosie Project ever since I first heard about it. It sounds like such a fun read. I’ll be watching for your review. Have a lovely week, Mary! I meant “Leslie”! I was just on the phone with my friend ( Mary), and my brain hadn’t switched gears. I am intrigued by The Rosie Project…I’ll be watching for your thoughts. Enjoy your week! Three great titles, and I love how you displayed them. Very lovely and creative. I am finishing up THE SWEETEST HALLELUJAH…it is good. Wonderful mailbox. Red Hill sounds interesting. The Rosie Project sounds good! Enjoy your new audiobooks, Leslie. I’ve been hearing marvelous things about The Rosie Project! I’ve heard got things about The Rosie Project – hope you’ll enjoy it. Red Hill sounds interesting. Enjoy your new books! I read The Rosie Project in June. It’s been a huge book in Australia this year, so glad that it’s getting world wide success too. It’s a delightful, funny read, I hope you enjoy the audiobook, I’ll look forward to your review.